Which are the closest islands to Florida? From Palm Beach, Miami, Ft Lauderdale, Bimini is only 50 nm, Grand Bahama Island only 60nm. What equipment is required to fly to the islands? 3. US Coast Guard-approved life jackets for each person on board. A life raft is not required, but is advised. What special procedures do I follow when departing the US? 1. File an International or DVFR Flight Plan and activate it in the air. 1. Close the Flight Plan in the air prior to landing on 124.2 or 128.0 (Nassau Radio) or, if unable, with 800-WX-BRIEF or 242-377-7116 on the ground. No, but you will be able to stay in contact with the Miami Centre until they hand you over to the Nassau Approach. Is fuel readily available, and how expensive is it? Avgas is currently available at nine airports on the islands. You are never more than 20 minutes flying time away from fuel. The average price of avgas is currently $2.85 a gallon. Can I land at any airport? 1. You must land at an Airport of Entry (AOE) the first time you enter the islands. 2. Normal hours for Customs are 9am - 5.30pm daily. Check with the airport for specific hours. 1. Instrument rated pilots can fly IFR into Nassau or Freeport after sunset. 2. These are the only airports with instrument approaches at this time. Some other airports have lights for emergency use, and others will be added in the near future. What proof of citizenship is required? You need a Passport for entering The Bahamas, and returning to the US. Complete either four General Declaration forms (C7) or, if you will be travelling to other islands, four copies of the Cruising Permit (C7A). You keep one stamped copy with you to show Customs at other airports. In addition, an Arrival Report is required at Nassau and Freeport, and at some other airports for twins. Each person also will complete a Bahamas Immigration Card. All forms are available for download. 1. 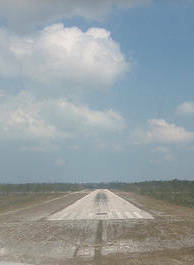 Landing fees are waived for single-engine aircraft at all government owned airports. 2. Twins pay a small fee from $4 to $15. 3. Private airports may charge landing/parking fees, usually $4 to $15. 4. The FBOs in Nassau and Freeport may charge ramp fees as well. 5. All persons pay a $15 departure tax, including the pilot and co-pilot. You must submit a request by fax to Nassau Civil Aviation along with a copy of your Special Airworthiness Certificate, Registration and Experimental Operating Limitations. Fax: 242-377-6060, information: 242-377-3445. Yes, but you will need an Import Permit. Call Agriculture on 242-325-7502. Do I need to file a Flight Plan when flying between islands? No, just be prepared to show your Cruising Permit at Customs, if applicable when you land. What forms must be filed when departing? Fill out two outbound General Declaration forms (C7), surrender your copy of the Immigration Card, and pay the departure tax of $15 per person. What kind of Flight Plan do I file when returning to the US? 1. You will file an International Flight Plan with 800-WX-BRIEF or Nassau Radio 124.2, 128.0. 2. Once in the air, you must contact Miami Radio 15 minutes before penetrating the ADIZ, just past Bimini. Contact Flight Service on 126.7. They will give you a discrete transponder code. Do not penetrate the ADIZ without this code. Is ADCUS on the Flight Plan adequate notice for US Customs? Do I have to land at any particular airport in the US? No, and there are many convenient Florida airports with US Customs. How can I get more complete information on all the airports and procedures? The Bahamas and Caribbean Pilot's Guide is the complete source of all the information you will need. It can be purchased at many Florida FBOs, or directly from Pilot Publishing at 800-521-2120, 760-742-2281. What numbers should I call for weather information? Both in the U.S. and The Bahamas 800-WX-BRIEF /242-377-7178 /242-377-7116.